Have you ever wanted to fly, but have been turned off by expensive lessons or even more expensive licenses? Since the beginning of time, man has dreamed of taking to the skies and exploring the wonders of the world from above. Whether you want to escape today’s pressures or just want more out of life, the Six Chuter Powered Parachute allows you the opportunity to realize your dream of flying. It’s easy! It’s safe! And, best of all, it’s affordable! World leader in powered parachute industry. Well over a decade of unparallel safety in the aviation industry. Powered parachute training is easy and affordable. Our aircraft are uniquely different from conventional fixed wing aircraft. Fly out of the confines of your field or pasture. Training allows you to qualify for an Ultralight Pilots Licence. The recreational vehicle of the future. The Six Chuter Legend is our most popular powered parachute. 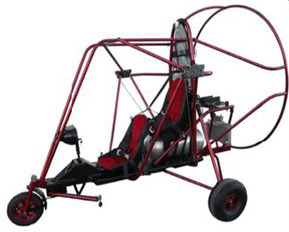 Equipped with the Rotax 582 engine it is one of the best performing powered parachutes in the world. The standard kit comes with everything required to get you airborne in one of the safest and most economical ways to fly. The Six Chuter Legend is available in three different airframe configurations including: Legend XLss with No Frontal Bars, Legend XLss with Optional Frontal Bars and the Legend Hdlx with the “Halo” Outriggers and Frontal Bars.